What are the key rationalities that underpin planning policy discourses and how do they 'frame' seemingly irreconcilable conflicts around development and environmental protection? Providing a thorough assessment of these important questions, this stimulating book reviews planning policy in the UK and the rationality of 'sustainable development'. Supported by a wealth of empirical material collected over the past ten years, the study examines the national, regional and local tiers of planning for housing. 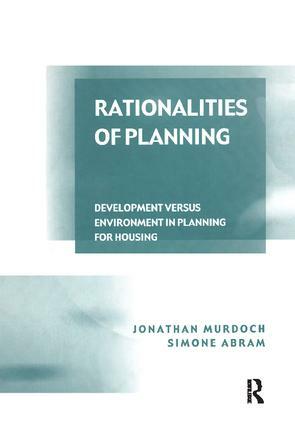 It analyzes whether the rationality of planning for 'sustainable development' allows a new spatial sensibility to inform planning policy, and whether it still responds to the social demands that were previously incorporated within the developmental method. The overriding concern, which the authors respond to and expand upon, is whether planning for sustainable development can provide a satisfactory basis upon which to re-establish contemporary planning. Contents: Planning and the governance of growth: theories and issues; The changing rationalities of planning policy; The policy hierarchy in planning; Planning by numbers; Competing rationalities in structure planning; Down to the district: local expressions of development and environment; Towards a new rationality of planning? ; Bibliography; Index. Jonathan Murdoch, Cardiff University, UK. Simone Abram is Reader in Tourism and Cultural Change at Leeds Metropolitan University, UK.